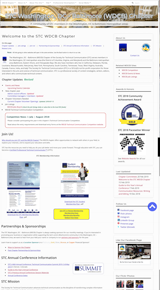 See the Chapter Honors page for information about Chapter Achievement, Chapter Pacesetter, Newsletter and Public Relations Competition awards given to the chapter. WDCB 2018 home page layout (partial). in the category of "Websites – WordPress Sites". The 30th Annual Awards for Publication Excellence, APEX® 2018, is an annual competition for publishers, editors, writers, and designers who create print, Web, electronic, and social media. The awards were based on excellence in graphic design, editorial content and the success of the entry—in the opinion of the judges—in achieving overall communications effectiveness and excellence. 1,408 entries were evaluated, in the following distribution: Newsletters: 102; Magazines, Journals & Tabloids: 287; Annual Reports: 41; Print Media: 97; Electronic Media: 111; Social Media: 54; Apps: 11; Websites: 80; Campaigns, Programs & Plans: 109; Writing: 284; Design & Illustration: 163; One-of-a-Kind Publications: 69. A total of 100 APEX® Grand Awards were presented in 12 major categories to honor the outstanding works in those categories. 556 APEX® Awards of Excellence recognize excellence in 100 individual categories. APEX® Awards 30th Anniversary Winner badge for 2018. 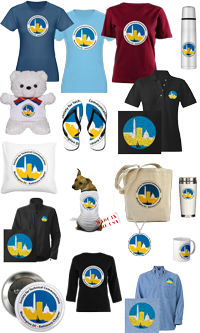 WDCB 2015 home page (partial) layout. in the category of "Websites – 1-2 Person-Produced". The Twenty-Seventh Annual Awards for Publication Excellence, APEX 2015, is a competition for communications professionals. 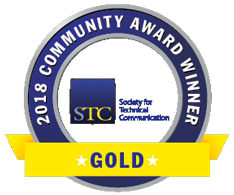 The awards are based on excellence in graphic design, editorial content, and the success of the entry in achieving overall communications effectiveness and excellence. APEX awards of Excellence recognize exceptional entries in each of the individual categories. A total of 1,851 entries were evaluated. Of those entries, 82 APEX Grand Awards were presented to honor outstanding work in 11 major categories; and 749 APEX Awards of Excellence recognize exceptional entries in 100 individual categories. 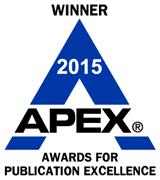 APEX® Awards Winner badge for 2015. 2014 — Won an Excellence Award in the 2014 APEX® Awards for Publication Excellence in the category of "WordPress Sites"
WDCB 2014 home page (partial) layout. The Twenty-Sixth Annual Awards for Publication Excellence, APEX 2014, is a competition for communications professionals. The awards are based on excellence in graphic design, editorial content, and the ability to achieve overall communications excellence. APEX awards of Excellence recognize exceptional entries in each of the individual categories. A total of 2,075 entries were evaluated. Of those entries, 100 APEX Grand Awards were presented to honor outstanding work in 11 major categories; and 832 APEX Awards of Excellence recognize exceptional entries in 122 sub categories. APEX® Winner award for 2014. 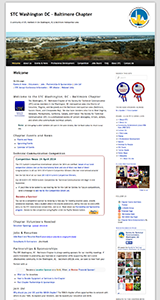 2009 — Won a Grand Award in the 2009 APEX® Awards for Publication Excellence in the category of "Web & Intranet Sites; Nonprofit Small Office". WDCB 2009 home page layout. 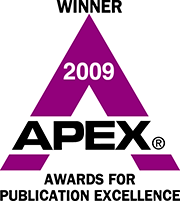 The 2009 APEX® awards are based on excellence in graphic design, editorial content and the success of the entry—in the opinion of the judges—in achieving overall communications effectiveness and excellence. A total of 3,785 entries were evaluated. Of those entries, 100 APEX Grand Awards were presented in 11 major categories to honor the outstanding works in those categories; and 1,158 APEX Awards of Excellence recognize excellence in 122 individual categories. APEX® Winner award for 2009. 2005 — Won an Excellence award in the 2005 APEX® Awards for Publication Excellence in the category of "Web & Intranet Site Content & Writing"
WDCB 2005 home page (partial) layout. The 2005 APEX® awards were based on excellence in graphic design, editorial content and the success of the entry—in the opinion of the judges—in achieving overall communications effectiveness and excellence. A total of 4,942 entries were evaluated. Of those entries, 100 APEX Grand Awards were presented in 11 major categories to honor the outstanding works in those categories; and 1,523 APEX Awards of Excellence recognize excellence in 109 individual categories. APEX® Winner award for 2005. 2002 — Our job announcement pages were awarded with a listing in the (WEDDLE's 2002 Recruiter's Guide to Employment Web Sites) on 21 February 2002. 2001 — Our job announcement pages were awarded with a listing in the (WEDDLE's 2001 Guide to Employment Websites) on 11 January 2000. 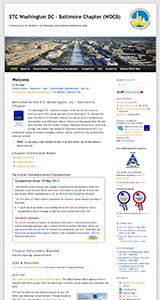 1997 — The Lone Star Chapter of the Society for Technical Communication (STC) holds a World Wide Web Page Competition. WDC 1997 home page layout. This competition recognizes technical excellence in World Wide Web page design. This website won an Award of Achievement in the 1997 World Wide Web Page Competition sponsored by the STC Lone Star Chapter in Dallas/Fort Worth, Texas.